Gary and I wanted to thank you all again for taking such good care of Felix. He went last week for his check up with Shane Veterinary Medical Center and weighs a pound more than when he left the hospital, 9.6 pounds. Dr Shane said his tumors went from a 10 to a .9. We are so happy to hear he is on the road to recovery. The last ten days he seems to have taken a turn for the better. He now sits on the baloney in the sun for hours at a time and cries a lot less. 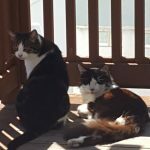 He seems to be able to go longer without crying for food and we now let him back in our room to sleep and that seems to help as well.I have attached a picture of Felix (black and white cat) with his brother sitting in the sun. They are inseparable and his brother was so happy to have him back. Thank you again for everything and we do believe you saved Felix’s life.